A fine quality mid 19thc Anglo Indian hardwood (rosewood) 3 drawer writing table, possibly from the Bombay region. The solid rosewood top is of excellent patina (colour) with a carved edge of egg & dart design. There are 3 frieze drawers on the front with sophisticated carving of a foliage design. This leads down to a carved gadrooned decoration and this same carved design is replicated on all sides. The end supports are a stylised lyre design with profuse foliage carving leading down to carved splay legs, terminating with serpent style feet. 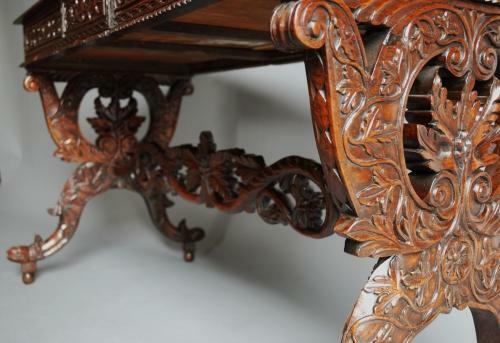 There is a foliage carved shaped stretcher supporting the legs. This table could be used both as a writing table or centre table or for any purpose. The table is of stable construction and can go straight into a home.